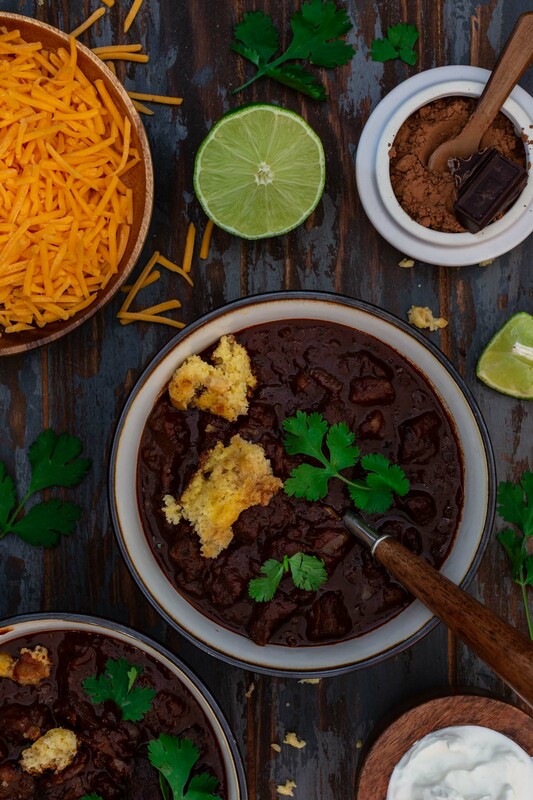 If you’ve never tried Chocolate Chili, you are in for a treat! This is the richest chili I have ever tasted. The chocolate adds a deep and slightly sweet flavor that counterbalances the heat from the chili powders. It’s a must try and a great way to feed a football crowd! This week I thought it would be a good idea to focus solely on recipes you can serve on Super Bowl Sunday. I’m sure we are all planning Game Day menus and are in need of a little inspiration. 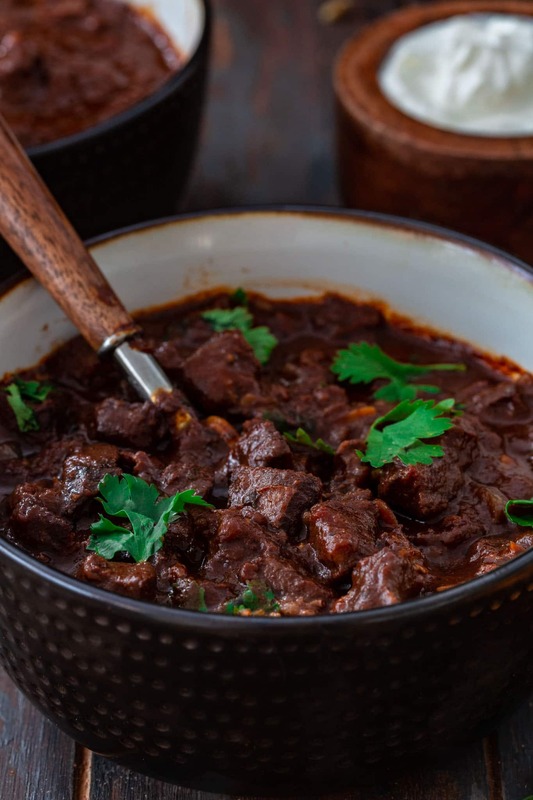 I recently shared my Fried Cheese Curds and Kielbasa Sausage Bites, but a big pot of chili is always a great call when serving a hungry crowd! I first came across chocolate chili at a local farmer’s market here in NJ. I remember browsing through their menu and being intrigued at the addition of chocolate to one of their chilis. My first experience with Mexican mole wasn’t all that great, so I was skeptical, to say the least! But I was feeling bold, and I bought it anyway. Oh, it was delicious! If I didn’t know it had chocolate in it, I would have never guessed. It was robust, hearty and perfectly balanced! I was determined to come up with my own version of a chocolate chili and, after a few months of perfecting it, I think I have a winner. I went for Texas-style, meaning there are no beans in this chili, but you can totally add them or serve them on the side, if you are a bean-lover! There are a million and one chili recipes out there, but they all follow the same formula! You brown the meat, add some veggies, spices and some sort of liquid and then braise for an hour or so, until the meat is tender. You can make it with beef, turkey, chicken, vegetarian, vegan, with beans, without beans, spicy, mild, whatever way you like it! The chili we are discussing today is made with chuck roast meat and, obviously, a bit of chocolate. However, there are other fun additions that, in my opinion, make this chili so fantastic. Bacon – cause everything tastes better with bacon. Cinnamon – adds a warm spiciness that compliments the heat of the chili. Stout Beer – brings out the beef flavors. Balsamic Vinegar – added at the end so its bold fruity and tangy notes can shine through and pair with the deepness of the chocolate. The goal here is to not be able to taste any of these ingredients by itself. They should all come together smoothly, giving the final product a robust flavor and succulent richness. 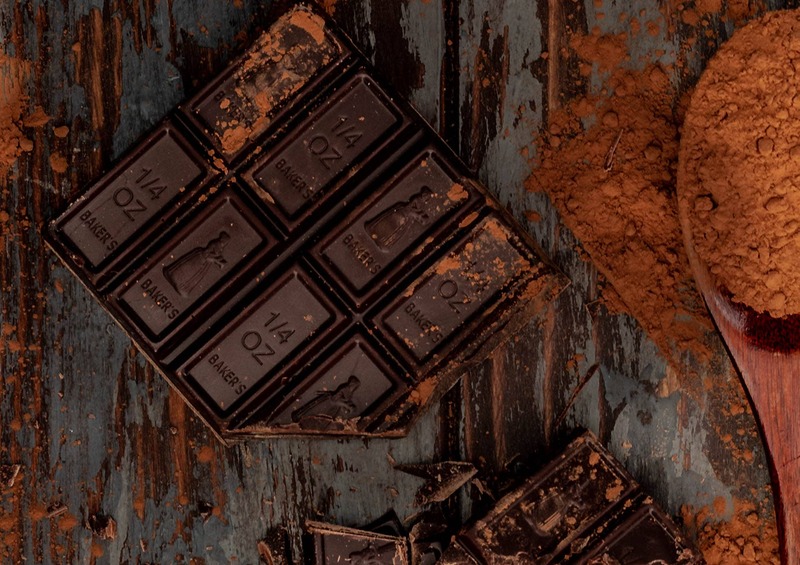 We use two types of chocolate in this recipe: cocoa powder and dark or bittersweet chocolate. If you are concerned about the chocolate making the chili slightly sweet, use unsweetened chocolate instead of the ones that contain sugar. That way you will get the body, color and the luxurious mouthfeel without the sweetness. Keep in mind that a little goes a long way! 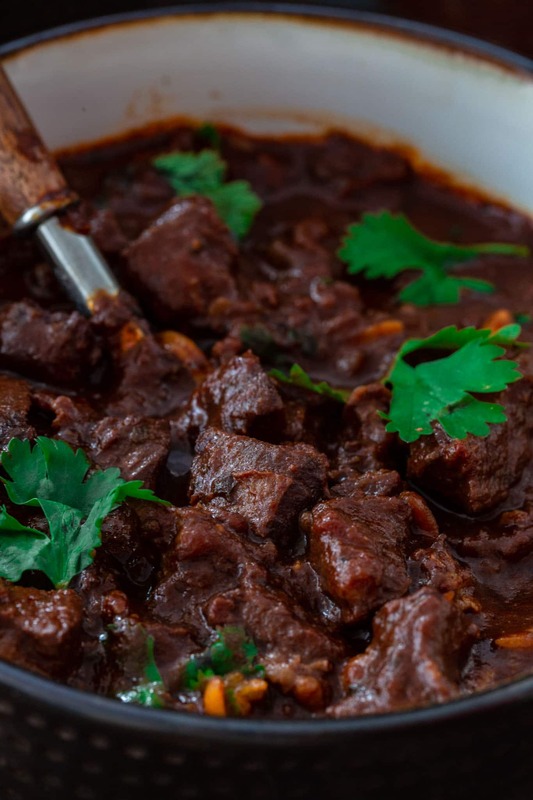 The idea isn’t to taste the chocolate, so one tablespoon of cocoa powder and 2 ounces of chopped dark chocolate are enough to give the chili multiple dimensions. While Chili Powder is a blend of ground chiles (usually a mix of different varieties, from ancho to cayenne) and other spices (like garlic powder, cumin and oregano), Chipotle Chili Powder is just dried, smoked jalapeño peppers in powder form. You might thing that chili powder is hotter, since it contains cayenne, but it is actually pretty mild! It is blended with other spices and made to please as many taste buds as possible, after all! Chipotle powder, on the other hand, has the same heat profile of fresh jalapeños, so it is spicier. The main difference here is the smokiness of the chipotle powder, created during the drying and smoking process, and its fruity undertones. Can I substitute Chipotle Powder? 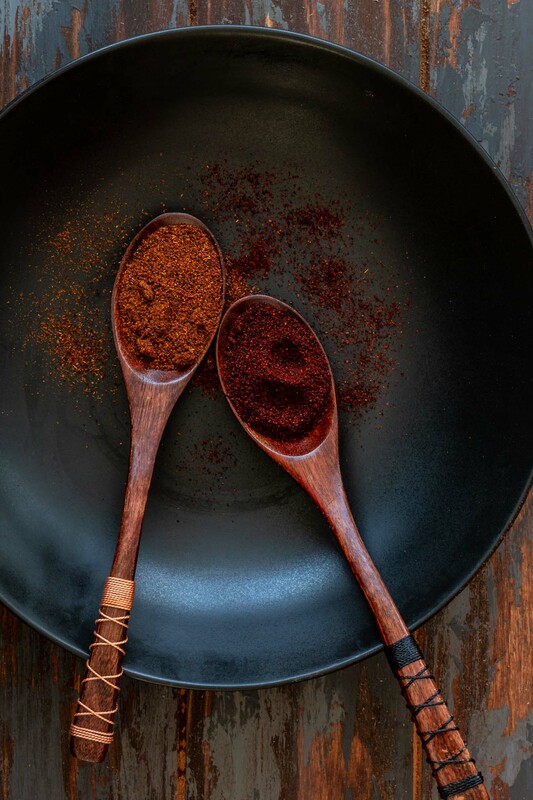 If you can’t find chipotle chili powder, just substitute for the same amount of chili powder or use smoked paprika. I wouldn’t substitute chili powder for chipotle powder, since that might overwhelm the dish! Chocolate pairs beautifully with chiles, so feel free to crank up the spicy heat on this batch! It is plenty hot for me, but I’m known to be a bit of a spice wimp. 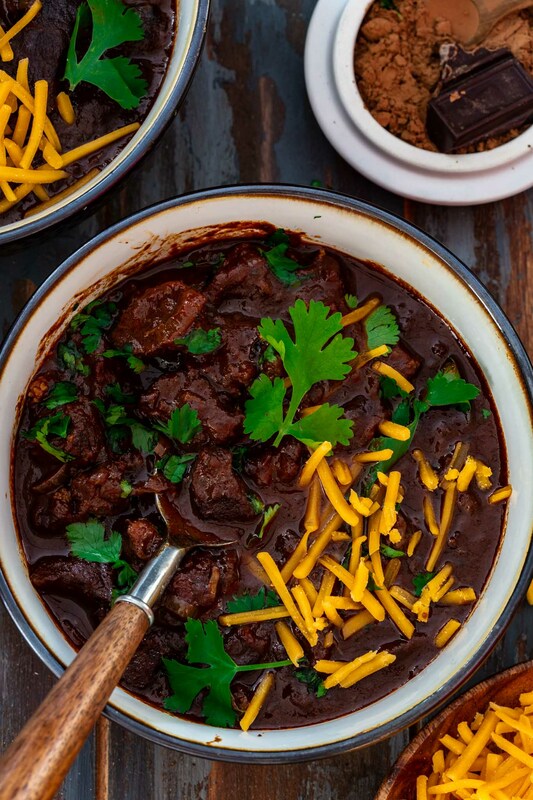 What to serve with chocolate chili? I serve this chili as I do most of my other chili recipes, with cheddar cheese, sour cream and a handful of cilantro for freshness. Since there are no beans in the chili itself, you can serve them on the side, so your guests can add if they’d like. If you’re tired of the same old chili, break out! Make this. You will never wanna go back to chocolate-less chili again! The richest chili I have ever tasted. The chocolate adds a deep and slightly sweet flavor that counterbalances the heat from the chili powders. It's a must try and a great way to feed a crowd! Season steaks generously with salt and pepper. Heat oil in a large Dutch oven, over medium high heat, until shimmering. Add the steaks and brown for 4-5 minutes per side. Remove and reserve. Lower the heat to medium and add the bacon. Cook until it begins to brown, about 4 minutes. Add the onions and sauté until they begin to brown, 7-8 minutes. Then, add the garlic and cook for a minute or so, until fragrant. Cut the seared steaks into small chunks (about 1/4-inch thick) and add them back to the pot. Add the spices and cook for a minute to release its flavors. Add the stout, broth, tomatoes, tomato paste, brown sugar, cocoa powder, chopped chocolate, bay leaf and a pinch of salt and pepper. Lower the heat to a simmer and cook for at least 1 hour, or until the meat is tender and the chili is rich and thick. You can add more broth, as needed, if the chili gets too thick. When done, stir the balsamic vinegar. Taste and adjust salt and pepper, if necessary. Best recipe for this strong winter!